The valley floors around the Cape Winelands have been cross-stitched with vineyards since the Dutch East India Company put down roots here in South Africa’s Cape Colony in 1652. Three and a half centuries later, the sun-splashed landscape where herds of wild elephants once roamed has become a site of pilgrimage for gourmands. Here are seven of the best ways to experience South Africa’s Cape Winelands. While the colours of the pretty patchwork quilt laid over the Winelands’ landscape changes throughout the seasons, many of the folds of the valley remain smudged green year-round. 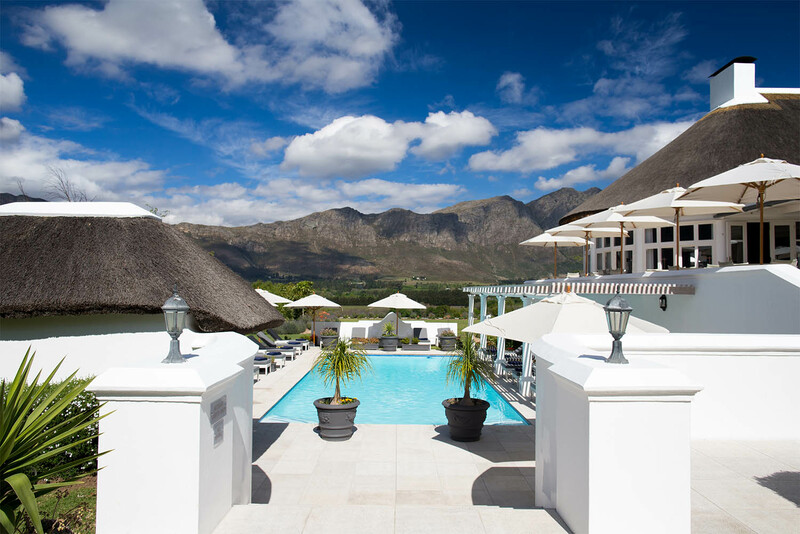 Map out must-visit spots along the five rail routes and then board the Franschhoek Wine Tram, the hop-on-hop-off double-decker tram-bus that rattles through the vineyards and deposits visitors at some of South Africa’s oldest and most distinguished wine estates. Pinotage is South Africa’s signature wine and, like its native homeland, is in equal parts complex and charming. One of the best spots to try this drop –­­ which is rich with peppery spice and dark berry fruits – is at Beyerskloof, which overlooks the spiky peaks of grand Simonsberg mountain. Follow the signs for wynproe and verkope (tasting and sales) to try the wine that pairs well with venison and spicy curries. The hills around the famous vineyards of Stellenbosch and Franschhoek are home to baboons, antelopes and leopards. Take a half-day Panorama Route tour with Ilios Travel to the top of the Drakensberg escarpment where you can look out over the bluff from ‘God’s Window’. Here, the play of light over this painterly landscape of sky and rock highlights the flower-studded fynbos and drifts of native grasses. The view of the Drakensberg Mountains looks so deceptively close from Mont Rochelle that it will make you feel positively Lilliputian. Owned by Sir Richard Branson, the property’s tranquil isolation is definitely part of its appeal. After a pre-dinner negroni, order rooibos-smoked kudu and a house salad with pea mousse, foraged leaves and pickled red onion. Partake in a post-prandial stroll around the 39-hectare gardens where the wild backdrop contrasts beautifully with Mont Rochelle’s manicured estate. Fill your travel bucket list for destination dining to overflowing at Franschhoek, in the French corner of the Cape Province. Here, in the tip of the continent, the Gallic traditions introduced by the French Huguenot pioneers remain evident when musing over the menu at Monneaux Restaurant at Franschhoek Country House, where you can sample springbok steak with bilton-spiced root veg and a red wine jus paired with a peppery pinotage. Reuben Riffel is a South African celebrity chef and he’s part of the reason Franschhoek has a reputation for being a food and wine hub. Start your extravaganza at Reuben’s Restaurant & Bar with West Coast Oysters followed by bobotie-spiced lamb shank and crispy fried polenta. You can also get a feel for the neighbourhood culture at Franschhoek Village Market, held on Saturday mornings in the centre of the village or by simply joining the dots between cafes and restaurants. What better way to appreciate a drop of pinotage or silky pinot noir than by arriving at a cellar door on horseback. Paradise Cottage & Stables offers visitors horse-riding tours through vineyards and forests and over mountains, stopping at the Rickety Bridge Winery and Mont Rochelle along the way. The tours are led by national endurance team member, Pieter Hugo, who has a stable of pure-bred Arabian horses, which will suit everyone from rank beginners to experienced riders.